We are glad that you like our fireplace. If you have any question, you can contact our customer service at: servicedecorflame@jakeglobal.com. 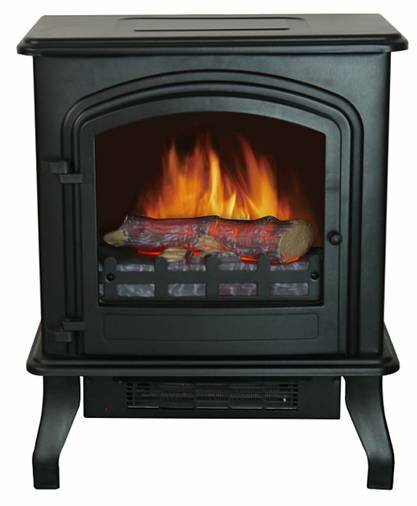 I purchased the Decor Flame Infrared Stove Heater for our 10x12 spare bedroom which is always drafty and cold. I have company coming over for Christmas and wanted them to be comfortable. It comes assembled for the most part, all you have to do is put the legs on which took me less then 3 minutes. The flames create an ambience and look real and the heat it kicks out is amazing. I love the look of this heater and the door actually opens. It looks so cozy in our spare bedroom and our guests will be cozy & warm. Would definitely recommend this to a friend. Price is right, and it won't make my electric bill sky rocket. I was quite pleased with my heater purchase on site alone after I opened up the box. I was impressed that all I had to do was put on the legs to get the heater up and running. The heater warms up my glass enclosed sun room really fast, and the style along with the log light on or off adds a cozy ambiance! The only problem is that the screws for the legs are small and it maybe awkward for someone with large hands to accomplish. I also recommend a magnetized screw-driver(helpful). I would suggest this product to anyone who needs a portable heater. Another perk it was delivered to my door with no shipping charge and no trip in traffic to an over crowded parking lot to stand in a check-out line(always a plus). Description on Walmart.com labeled this as "programmable". It is not. There is a thermostat dial where you select the level of heat you want produced, but that's as programmable as it gets. The legs are PLASTIC. Don't know what I'll do if one of them breaks. Door is also plastic, but I'm not as concerned about that. The legs however, seem like they might break if the unit is pushed around on the floor, or too much weight is accidentally applied. This unit works very well. I have it in a bathroom. Pumps out more than enough heat for that space. We are glad that you like our fireplace. We take note of your comment. If you have any question, you can contact our customer service at: servicedecorflame@jakeglobal.com. It's fire looks real enough, but it doesn't heat any better than my 2foot space heater. Basically you're paying 30-50 extra for pretty flames. A friend has one of these and I was impressed by its appearance, warmth and price. If you don't want a huge console but still like the appearance of flames, this is a good product. It heats a surprisingly large space. The infrared is safer than other space heaters and the exterior remains cool to the touch. My only complaint is there is no information about how much energy it uses.